Earlier I was changing the channels amd saw Match Game on Buzzer Network, a channel of classic game shows. I watched for a few minutes. This was mid to late 70s show the innuendo is just oozing. Or I have a dirty mind. I thought male genitia for first it seemed so leading. Second question is also leading with the “in”. 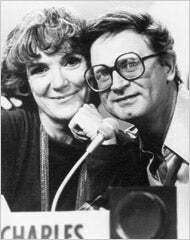 I forgot how genuinely funny Brett Somers and Charles Nelson Reilly were. I need to watch more often.